The Point Host is an (Model RS232 and RS422) 418 MHz radio receiver designed to receive and decode packet data from all Point Six Transmitters. The Point Host decodes the CRC-16 encoded packets and translates them to ASCII strings that are sent out the RS232 or RS422 serial port at 19200 Baud. No hardware handshaking or command protocol is required; all data packets are decoded and transmitted serially as they are received. 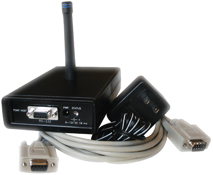 The Point Host is very low power; most RS232 ports provide enough power to operate the receiver. External power input is provided for host serial ports that cannot provide the necessary current. A simple design approach results in a low cost receiver that provides error checked ASCII data for all Point Transmitters.